Previous Godzilla lore is cast aside in Takao Okawara’s Godzilla 2000, a sustainable attempt to resurrect Japan’s greatest movie monster in the new millennium. After over twenty films, Godzilla has been woven through plots that are beginning to tangle on themselves. It is refreshing not to have to think about how Godzilla could both have sired a son in Son of Godzilla and been a mother in the American-made Godzilla (1998). Okawara’s efforts to restore Godzilla back to his original conception are well-intended, though the execution is heavily flawed. Instead of a Godzilla that puts fear back into the audience’s hearts, we’re given a Godzilla that we cannot help but laugh at. Godzilla 2000 is no better than the previous incarnations that it is trying to so hard to forget, purposely-bad English dubbing, silly battle sequences, and a lame-duck plot that only serves to fuel the fire. This movie might as well have been called Godzilla vs The Rock Monster. Yes, that’s right. The Godzilla oppressor here is an uncovered rock pulled from underwater. Scientists at Japan’s Crisis Control Institute discover that the rock is actually a space craft and want to harvest its powers for alternative energies. This does not go over well with the space craft/rock, whose whole purpose in coming to Earth revolves around Godzilla and his regenerative properties. These properties are first discovered by Yuji (Takehiro Murata), a former scientist that now fronts the Godzilla Prediction Network alongside his daughter, Io (Mayu Suzuki). GPN’s intent is to track Godzilla and learn more about him, while, naturally the Crisis Control Institute wants to destroy him. CCI's plan is to lure Godzilla to the rock creature and then blow them both up simultaneously. Not surprisingly, the plan backfires and the rock creature turns into a space ship that lands atop Crisis Control’s HQ and drains its computer database of all Godzilla knowledge. It’s now up to Godzilla to rid Tokyo of the alien being and save the city… again. It all sounds familiar, doesn't it? Having seen only a handful of Godzilla features, I knew each turn that the film was going to make before it even made it. Care to hazard a guess what happens in Godzilla 2000 when some military personnel fire new armor-piercing missiles at Godzilla? If you’ve seen a Godzilla sequel like King Kong vs Godzilla or Godzilla vs Mothra, not only do you know that these missiles do not harm Godzilla but that the military advances are inconsequential because the true test of Godzilla’s resilience will not come from human beings but from a fellow monster. Predictably in Godzilla 2000, the big green lizard is on a constant collision course with the alien life form and their battle occupies much of the final act of the film, as it did previously when Godzilla battled Kong, Mothra, Rodan, and so on. Screenwriters Hiroshi Kashiwabara and Wataru Mimura make no attempt to divert the plot from traveling in the hallowed footsteps of its predecessors. But the difference between those Godzilla sequels and Godzilla 2000 is in the sequels, Godzilla at least got to tangle with some serious foes, including King Kong, Mothra, and Rodan. Nothing about the appearance of the soaring rock in this film screams classic battle. In fact, Godzilla’s initial battle with the oversized rock is before it takes the appearance of a spacecraft, so the whole fight just looks like someone is standing just slightly off-camera throwing a giant rock at the big green lizard. To be fair, the climatic battle between the two is much more interesting when the space craft reveals itself to be a creature named Orga, who attempts to steal Godzilla’s DNA by devouring him whole. Unfortunately the film is only 98 minutes long, so this one entertaining sequence comes in about 80 minutes too late. Dialogue in Godzilla 2000 leaves the film in limbo somewhere between being insightful and being farce. Kashiwabara and Mimura use the character Yuji to touch upon interesting ideas in the script, the most intriguing of which being that Godzilla has regenerating DNA that could majorly improve modern science if the creature is studied, not destroyed. Yet an idea such as this is never realized and instead becomes drowned out in dialogue, which, thanks to some assistance from American screenwriter Michael Schlesinger, contains much more Western-influenced speech. “Great Caesar’s ghost!” is shouted at one point in the film, a reference that is limited to American audiences and obviously was not intended for the Japanese release of the film. I’m not quite sure where the script intended on going, because the theorizing suggests a more thoughtful film while the dialogue, with lines like, "I guarantee it will go through Godzilla like crap through a goose," suggests otherwise. I laughed at such ridiculous lines in Godzilla 2000 just as Okawara and his screenwriters intended. How else to explain the ending, where Yuki tells his daughter that “we all have a little Godzilla inside of us”? This is a lighthearted Godzilla affair, one to be laughed at, heckled, and secretly enjoyed, but the other sequels have been much the same. Much of the enjoyment that can be taken from this film, whether it be through the bad English dubbing or the preposterous fight scenes, can be found in all the other Godzilla sequels that this film tries to detract from. This begs the question: if Godzilla 2000 is like the two dozen sequels that came before it, what reason does a viewer have to choose this film over all the others? Unfortunately there is no reason. Godzilla 2000 is a better film than the one that preceded it (1998’s Godzilla) but it doesn’t fare against other sequels of the franchise that had much more interesting monsters and a much more fluid plot. Godzilla 2000 has the workings of an interesting plot somewhere within its script, but Okawara does not find it. His heart is in this film, but the originality isn’t. Part of Godzilla Week, a crossover event with The Sci-Fi Block. 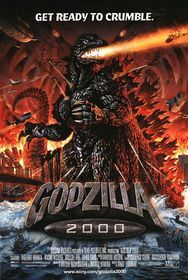 Read the SFB review of Godzilla 2000.